One of the big advantages of Project Fi, besides the seamless carrier switching and auto-connecting WiFi to known hotspots, is their great customer service. This weekend proved it once again. 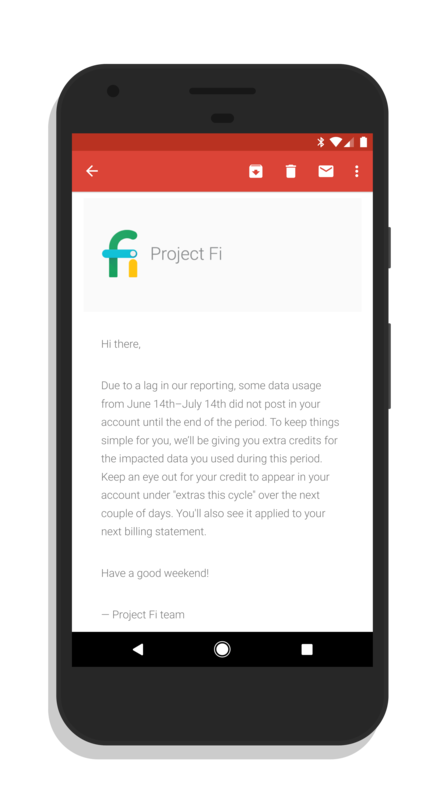 Multiple Project Fi subscribers received an email (you can see mine after the break) letting them know of a lag issue in their data usage reporting. Normally, if a carrier has this happens (which it does on all carriers at some point), they simply add the extra data use to your next bill. Not Fi. Nope, you get credits. Those credits are aimed at balancing out any data billing that was missed from June 14th to July 14th. In other words, you aren’t going to pay for a reporting issue on their side. Brilliant. their way to everyone so it may be another day or two before it shows up. I, for example, haven’t seen the credits appear in the app. At the end of your next billing cycle, those credits will be applied to your balance which should counterbalance the extra data use that will show up on that billing cycle. I personally have been a Project Fi customer for nearly two years and highly recommend it. If you have a Nexus 6P, 5x or a Google Pixel phone, it is compatible with the service. Further, Google will have partners building phones that will be compatible later this year. If you want to try out Project Fi, you can go to this link to get details and sign up. Oh, and if you use that link, once you have been a subscriber for 30 days, you get a $20 credit (and so do I). My review of Project Fi is here and my 6 month follow up can be found here.